GDPR (also known as EU General Data Protection Regulation) is considered one of the most important changes to data privacy regulation in the last 20 years and it comes into practice on 25 May 2018. That means we haven’t got long to get our acts together. So, today we are going to cover everything you need to know about your existing email subscribers and how to be GDPR compliant. In order to make your existing email subscriber database GDPR compliant you need to complete A Permission Passing Campaign. WHAT IS A PERMISSION PASSING CAMPAIGN? Simply put, you need to have your existing EU email subscribers give you explicit permission to continue emailing them after 25 May 2018, once GDPR takes effect. This is done through a process of going to your list or database of email subscribers and creating an opt-in. An opt-in is a very clear and specific statement of consent by a visitor, giving you permission to communicate with them. The most usual method for an opt-in would be a checkbox on the form, which is not checked by default. You should make it very clear on what they will be receiving and if you share or sell the data to anyone else. You should avoid making opt-in consent a precondition of a service or bundling opt-in as an assumption in your terms and conditions. Statistics show that you will most likely see a drop in your email subscriber list as a percentage of people will not opt-in to receiving your emails after the 25 May 2018. 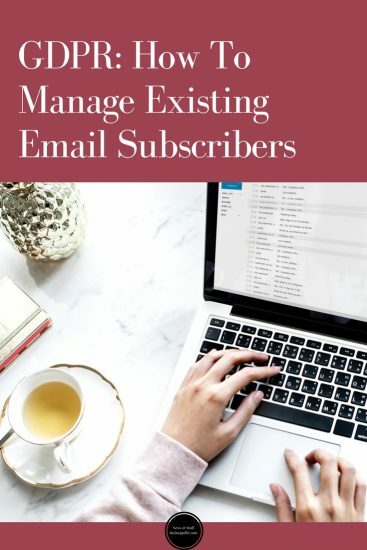 While on the surface this might sound like a counterintuitive process, it does open the benefits that your mailing list is up-to-date, and has only subscribers who are interested in hearing more from you, and about your services. By having your subscribers opt-in to your emails, you know that the people who remain on your list want to be there. So how does that help you? All subscribers that are listed after 25 May 2018 want to be kept informed about your business. This means that they are more open to becoming a first-time or repeat customer and therefore, are more likely to work with your business. Better Investment. From your point of view, after the 25 May, you know that all the time and effort that you put into your email campaigns is a good investment and that your subscribers are being sent out to people who want them; are more likely to read them and are more likely to invest in them. Higher Personalisation. It’s becoming increasingly popular to really personalise email campaigns and, of course, this is easier if your email subscriber list is clean and up-to-date. Lower Costs. If you are paying for an email marketing program such as MailChimp or Mad MiMi you could save some money. Often these companies charge based on how many subscribers you have or how many emails you are sending per month. If your subscriber list is now more concise but focused, you could be able to drop down an account level. HOW DO YOU COMPLETE THE PERMISSION PASSING CAMPAIGN? The goal of this process is getting your existing email subscribers to opt-in to your post-GDPR subscriber list and get this recorded. Generally, you will be holding your email data in a CRM, email platform (such as MailChimp or Mad Mimi) or within your email servers (such as Outlook or Google Mail). This should tell your email subscribers some valid reasons why they should opt to stay on your email list so that as many people as possible continue to subscribe. You might also want to add as much personalisation as possible within the email e.g. addressing them by name, maybe referring to the last time you worked with them and adding additional content about something you think could interest them.